A Classic Analog Synth Returns with a Smaller Footprint! Honey, I shrunk the synth! Recreated in a compact form, the Korg MS-20 Mini does exactly what the 1978 version did, but in a size that's 86 percent of the original. This little monophonic analog synthesizer sports 37 keys; knob design and printing that stay true to the original's; and in the patch section, mini plugs rather than 1/4-inch phone plugs. Making a good thing even better, Korg has released the MS-20 Mini as a portable, affordable, and easy-to-use synth for today's musicians. The MS-20 Mini boasts two oscillators with ring modulation, envelope generators with hold and delay, and a VCA designed to produce less noise than the original. Powerful self-oscillating high-pass and low-pass filters with distortion lend the synth a radical sound, while an external signal processor (ESP) gives the MS-20 Mini extra flexibility by allowing you to use the pitch or volume of an external audio source to control the synthesizer. Want to play the MS-20 Mini as a vocal synth? No problem -- just input a microphone. Want to use it as a guitar synthesizer? Input an electric guitar. It's as simple as that. Thanks to a flexible patching system, you can create complex sounds by plugging in cables to change the connections between the various units. Unless you never mess with the cables, no two noodle/jam sessions will be the same, since different combinations of the modulation input/output and trigger, sample and hold, and noise generator can produce a wide variety of sounds. The MS-20 Mini has a MIDI In jack for receiving note messages, along with a USB-MIDI connector that can transmit and receive note messages. With this monophonic analog synthesizer, you can even connect it to your computer and play it from a sequencer. A development team led by the MS-20's original engineers was responsible for recreating the original circuitry. According to Korg, when it was necessary to substitute a part, these engineers made the decisions based on careful listening, in order to reproduce the original sound faithfully. With this said, however, the Mini version will never sound exactly the same as the vintage MS-20 as we know it today -- because its bright and extreme sound is that of an original MS-20 in mint condition at the time it went on sale in 1978, before any of the components aged. Korg's MS-20 Mini comes with the original MS-20 owner's manual and settings chart that explains how to create sounds, and even its packaging has the same look and feel of that of the original unit. Korg's MS-20 monophonic synthesizer, first introduced in 1978, is still a coveted instrument to this day, thanks to its thick, robust sound, its powerful, iconic analog filter, and its versatile patching options. Today, the sounds of the MS-20 have been reborn in hardware, as the MS-20 Mini. The same engineers who developed the original MS-20 have perfectly reproduced its circuitry and fit into a body that's been shrunk to 86% of the original size, yet retains the distinctive look of the original. The MS-20 mini will amaze you with its absolutely authentic analog synth sound. The MS-20 analog synth -- recreated in mini size! MS-20's design concept started by borrowing from the vertical layout found on larger and more expensive modular synths of its time, and then creating a more portable, inexpensive, and easier-to-use version. 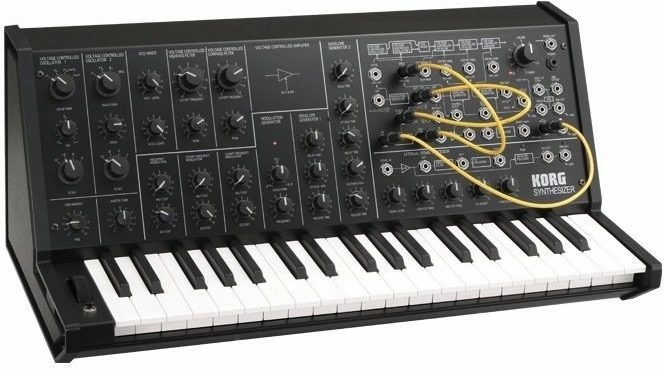 To make it even more approachable, the MS-20 mini has been shrunk to 86% of the size of the original MS-20. In spite of its smaller size, meticulous care has been taken to accurately reproduce the knob design and the printing. The patch cables have been changed from 1/4" phone plugs to mini-plugs, and the keyboard is also 86% of the original size. Korg's effort to remain faithful to the original is not limited to the unit itself. Even the package that contains the unit replicates the original as far as possible. Also included are the original MS-20 owner's manual and settings chart, explaining how to create sounds. Now you can experience the excitement of the MS20, just like it was during its original release in 1978.
" For enthusiasts and singer songwriters a like"
Overall: first off, this is my first analog synthesizer, I wanted to be able to learn without getting into something overly convoluted and felt this was the best place to start and let me tell you, I was right. Out the box this thing really sets the tone. (No pun intended) as many of you know the MS20 mini is a re-issue (thus the mini part) but this has no effect on the sound nor the way it plays. Quite frankly I could write a pretty lengthy review but being that I'm typing this from a cell phone I'll keep it short. The MS20 will pull you away from the computer, and not in bad way. Although the MS20 can receive midi data from your computer (there's no velocity available in the MS 20 so all the notes are set to maximum) you'll have to do all the modulation by hand, and that's where the fun kicks in. And yes there is a clear difference between analog and digital. I must say adding the MS20 to my mix gave me more "umpf" that my virtual synths where lacking. If you're on the fence on getting one let me say this, I consider myself more of a singer/song writer then a "producer" and although this has a steep learning curve I feel I've been able to write better music with the MS20 then without it. And lastly, My hats off to zZounds. Seriously, these guys make it possible for some of us to keep current without breaking the bank. Their financing options are extremely flexible and fair. I honestly believe that most of their employees are musicians and generally care about the products they sell and the service they provide. High fives all around! "BEST THING I'VE EVER BOUGHT!" 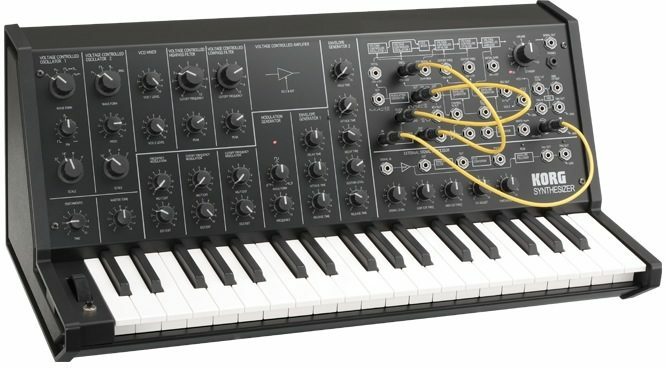 Overall: i've dreamed of owning an Ms-20 for year upon years, but could never seem to fork the high dollar price they were going for. so im browsing through zzounds website looking at synths for giggles, & then i see it! the Ms-20mini! at first i thought it was the computer controller they made, until i realized its an actual hardware synthesizer. my life has'nt been the same since, its been better with this synth in my life! everything about it is stunning, pure analouge fun!! patching with external gear is an ease & works/sounds amazing! the filters scream like no other synth out there. if you know about the Ms-20 then you know what i mean! just buy one already!! make the payments on zzounds, your life with be that much better! promise!